This offering takes a group of women on a journey of personal transformation, designed to promote personal growth and self-awareness. The curriculum includes ancient wisdom and modern truth, based on Yogi Bhajan's teachings of Kundalini Yoga and the power of women. Explore your unique strengths, caliber and innate wisdom that are your gifts as a woman; learn to live authentically, comfortable with your own power; rejoice in the experience of the nurturing support that a sacred circle of women can generate for you. You learn techniques of yoga, breath, meditation and self-care, improve your health and vitality, radiance and well being. You explore the depths of your spirit and create a stronger connection to your soul so that you can enhance your life experience and craft new possibilities for the future. "Excel & Celebrate was a very happy and empowering experience for me. Sharing with the women in the circle was most uplifting and it gave to my life a great sense of peace, healing and harmony." "After our sessions, I felt a deep sense of acknowledgement, appreciation and a re-alignment with my beauty within." Woman is the “the flow of spirit, the radiance of light”. She embodies the primal creative force of the universe and is the torchbearer for the sensitivity of the human spirit. As women have done for centuries, we gather together in a Sacred Circle for spiritual nurturing. Allow yourself to be embraced in the loving support of a conscious community of women. 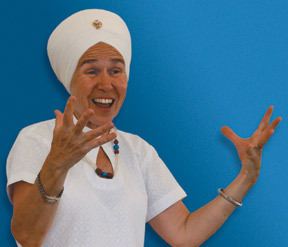 Excel and Celebrate is for all ages, with or without Kundalini Yoga experience. It is an excellent way to be uplifted and connect with others in an elevating environment. Rejoice in the experience of the support of a sacred circle of women. As women, we have many unique strengths and innate wisdom which we discuss and explore. Together, we share and discover what it means to live in our power. This is an incredible opportunity to establish a deeper connection to our soul and the joy of our spirit. Join us as we enhance our lives and create new possibilities for the future. Together, we reclaim our wisdom, joy and radiance. As we move forward with confidence, clarity and vitality we awaken our innate power as woman. 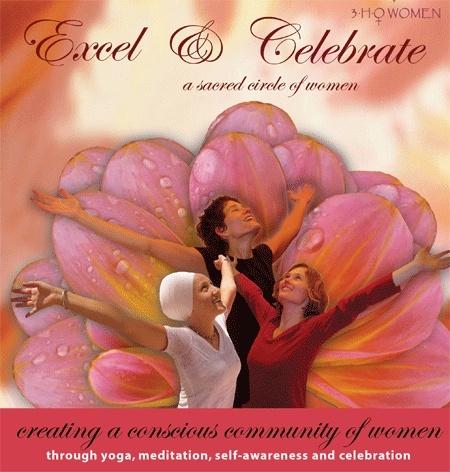 Excel & Celebrate created by Pritpal Kaur Khalsa, arose from a deep soul longing to create sacred circles of women supporting and elevating one another. Now, there are women all over the world experiencing profound change and joy from this personal transformation program. Join us to empower women worldwide. Share, grow, change, transform. Bring joy, upliftment, blessings and the gift of community to women, their families, children and our future. Be a part of this Sacred Circle and make a difference.